One of our favorite discoveries at Spring Market this year were the Gingham Girls. We immediately hit it off with these sweet sisters. Ann Weber and Joanne Rowicki of the Gingham Girls Pattern Company are gracing us with their presence to tell us their happily ever after story. We are the sisters of the Gingham Girls quilt pattern company. As sisters we enjoy many of the same things, one of those being the love of quilting. Even though we are separated by a thousand miles, with one of us in Virginia and the other in Wisconsin, we find creative ways to work together. We have been sewing ever since we were young girls, starting with sewing clothes for our dolls and moving to sewing clothes for ourselves. After getting married we sewed for the home and clothes for our children. 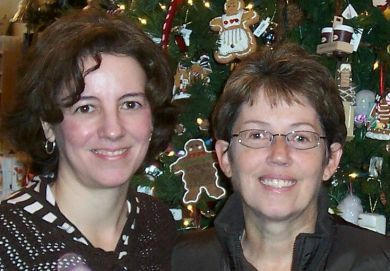 In the early 90’s, we both started quilting and have been hooked ever since! Over the years we have taken many classes, purchased lots of patterns, shelves of books and of course tons of fabric! We like to call this the “learning years,” using our patterns and books to guide and teach us. Slowly we began to break out and create our own designs. We have designed quilts for McCall’s Quilting and McCall’s Quick Quilts since 2003. We have also published patterns with Quiltmaker, American Patchwork & Quilting, Pat Sloan & Co. and Red Rooster Fabrics. After many years of publishing through others, it was time to go out on our own. Combining our love of quilting and gingham fabric, we formed the Gingham Girls pattern company in 2006. We are thrilled that we can now bring our designs directly to you. 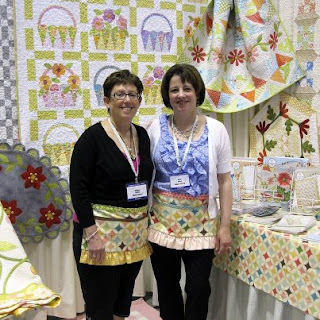 Even though our styles and color choices are a bit different, with Ann tending towards appliquéing over a pieced background using spring colors and Joanne tending towards pieced designs using winter colors, we think when our two styles are blended you get quilt designs that are original and fresh! We are very excited to share with you our latest quilt designs that debuted at Spring Market. Our patterns have clear directions, diagrams and helpful hints that all quilters will love. Not surprisingly, all of our quilts include a piece of gingham fabric. Have fun adding a bit of gingham to your quilts, too!